Part 1 was here. Two additional photos here. One of the two most surprising things about the area where Gene Sparling, Bobby Harrison and Tim Gallagher had their first sightings of the ivory-billed woodpecker is how close it is to two major highways, Arkansas Rt. 70 and U.S. Interstate 40. “This is about as remote as our mountain in Pennsylvania,” my brother points out as he parks the car at the end of a gravel road at the edge of Bayou DeView in the Dagmar Wildlife Management Area. Yeah, except our road isn’t this nice. The other surprising thing is how enthusiastically local folks have embraced their source of newfound fame. Yes, Virginia, there is a Lord God Peckerwood. He lives in the hearts and on the shade trees and lampposts of half the inhabitants of Brinkley, Arkansas (see maps here). Since the town’s restaurants and motels have depended on revenue from hunters and fishermen for so long, I guess it didn’t require too great a leap of faith for them to roll out the welcome mat for birders, too. I wish we’d had more time there. I see that our positive first impressions of the area were shared by Pat Leonard from the Cornell Lab, who posted an engaging travelogue of her own visit to Brinkley in September. I’m envious of her canoe tour of Bayou DeView with local guide and life-long resident Chuck Volner. Heading back, Chuck sums up some of his philosophy: “Everything in nature is beautiful. God didn’t make nothin’ ugly. You look closely enough, you’ll see everything is beautiful.ï¿½? Oh look, another beautiful cottonmouth. This one is swimming with its head above the water and glides right next to the canoe. But we’re on our own, and being somewhat disorganized, we fail to take advantage of either of the two foot-trails or three water trails that have been set up for birders by the good folks at Dagmar. Instead, we park at a likely looking spot near where, as best I can tell, Sparling et. al. had their sightings, and proceed to do some bushwacking (otherwise known as walking in circles). That’s when Mark spots it. No, not the bird; the tree. In a swamp full of huge baldcypresses, this tree is enormous. I am beside myself. I’ve visited my share of eastern old-growth, but I’ve never seen trees this big east of the Cascades. Fortunately, as I mentioned in yesterday’s installment, the water level is low: the high-water mark was about five feet off the ground. So when Mark rolled up his pants to wade across to a nearby island for a better picture, I followed suit, continuing on across a wider channel to reach the island of the giant itself. The water was freezing cold, which gave me some confidence that I might not encounter a cottonmouth, though I’m not sure I would’ve desisted had there been snakes on every log. I’m six foot one, at least on rare occasions when I stand up straight. This is an undoctored photo. The tree appears to be close to fifteen feet DBH (diameter at breast height – the standard forester’s measurement). Even if you measure it at the point where it stops tapering, it’s still almost as wide as I am tall. Lord God, what a tree! The sun shines weakly through a scrim of clouds, which creates a pleasing symmetry: murky sky, murky water. A scattering of red maples and other understorey trees gives a splash of late autumn color, but what most attracts the eye is the great diversity of forms – a hallmark of true old growth. 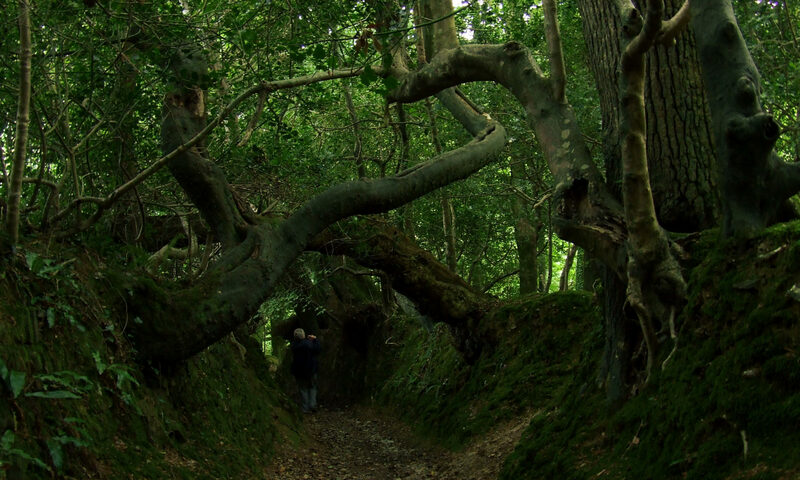 Trees get weird when they get old – check out the photo of “the yelling tree” in Pat Leonard’s essay. My brother marvels at a massive tupelo growing adjacent to an even wider rim of rotten wood: a several-hundred-year-old root sprout off a tree that may have begun life half a millennium before that. I know how old black gums can get from reading studies of Pennsylvania old growth. Only the baldcypresses get older here, I imagine. After a certain point, when the so-called heartwood rots out, it’s impossible to date them accurately, but some dendrochronologists feel that baldcypresses can get to be 2000 years old or more. I’m happy – I’ve come for the trees – but Mark isn’t so easily satisfied. I struggle to keep up as he strides off along the edge of the bayou. He scares up a few white-tailed deer, but otherwise wildlife seems scarce. As we head back to the car, a pileated woodpecker lets out a peal of its usual insane clown laughter – kind of like howling for wolves and getting barked at by a coyote instead. We explore Dagmar a little more by car, passing several other stands of impressive old growth on our way to a quiet picnic lunch. Mark subsequently discovers that field trips to Bayou DeView are the featured attraction of this year’s Eastern Old-Growth Conference, scheduled for Little Rock, Arkansas on March 24-25. Check out the aerial photo on its webpage. The rediscovery of the critically endangered ivory-billed woodpecker in the cypress-tupelo woodlands along Bayou DeView in eastern Arkansas, which still retains remnants of centuries-old baldcypress and tupelo forest in a heavily developed agricultural landscape, confirms the significance of our remaining old-growth forests and justifies the federal, state, and private efforts to conserve and restore the Big Woods ecosystem of the lower Mississippi Valley. Other draws for this conference include the old-growth post oak woodlands of the Ozarks, which are apparently as underwhelming as the swamp forests of Bayou DeView are overwhelming. Thanks to the pioneering work of the tree-ring lab at the University of Arkansas, we now know that there are many more remnants of ancient forests in the eastern U.S. than previously imagined. Why have these remnants of ancient forest escaped public notice? Because they don’t look like what we think an ancient forest ought to look like. I’ll bet a dollar against a doughnut that when somebody says “virgin forest,” you conjure up a park-like place with trunks as big around as Volkswagens. That’s from an article profiling the head of the tree-ring lab, Dave Stahle, who is also my authority for the probable age of the trees we’ve just encountered. Stahle and [Malcom] Cleaveland have also done extensive tree-ring work with baldcypress, a species especially valuable to dendrochronology because of its ability to live a long time. Stahle has sampled baldcypress stands in North Carolina that are more than 1,600 years old, and he’s found numerous sites in east Arkansas with trees over 500 years old. One site, on Bayou DeView, has more than a few 1,000-year-old trees.”And that’s just their provable age,” Stahle said. “Most of them are hollow.” Judging from the average thickness of the rings and the diameter of the center rot, Stahle is confident some of these graybeards are 1,300 years old. Think about that–some of the trees growing right now in east Arkansas were already mature before the Crusades began in medieval Europe. By the time DeSoto tramped through them on his way to fame, glory, and an early death, they were already 750 years old. We take the scenic route that afternoon on our way back to Mississippi. Mark has heard that the Pine City Natural Area, an isolated, genetically distinct population of loblolly pine, supports “the last remaining colony of the federally endangered red-cockaded woodpecker in the Mississippi Alluvial Plain of eastern Arkansas.” The presence of the site so close to the ivorybill area, on top of all the more common woodpeckers that occur here, means that the Arkansas Delta has the highest peckerwood biodiversity in North America. Navigating with the help of a woefully inadequate map – a page torn out of the National Geographic Road Atlas of the United States – Mark manages to find the right road, and soon enough we spot the dark smudge of a pine woods among the plowed fields. Signs on the trees identify it as a state natural area. Had we driven a little farther, we would have seen the official roadside sign, and two larger tracts, but we pull over by the first, narrow fragment of forest and set off on foot. Mark is in the lead as usual, scanning the treetops for the holes and sap marks that indicate the presence of red-cockadeds. We notice that many of the trees other than pines have been girdled, no doubt by land managers anxious to have the pines out-compete other species. We don’t see any evidence of recent fires, but I’m sure that prescribed burns are or soon will be an important part of the management strategy here. Natural fire regimes in the southern pinelands featured a fire return interval as brief as ten years. And while the South is one of the few parts of the country where whites carried on the pyrophilic practices of the Indians, many forest ecologists feel that the tendency to set fires in the winter, rather than during the growing season, hasn’t helped the southern pinelands, which have of course also been decimated by agriculture (as is the case here) and sprawl. Their value as timber means that few commercially managed pine forests ever get old enough to provide habitat for red-cockadeds, who excavate nest holes only in trees where the heartwood has begun to rot. After a quarter mile, we find the main nesting area, easily identifiable by the collars of sheet metal that have been put up to keep nest predators such as raccoons at bay. “Let’s sit down here and be quiet for a little while,” Mark says. “These are very shy birds.” His daughter temporarily lowers her voice by a few decibels. I’m sure it was just a duck. All photos here are by Mark Bonta except the first, second and last, which are mine. UPDATE (Nov. 11): Reuters has a new story on this season’s official search. Pingback: Festival of the Trees » Blog Archive » Come one, come all!